"Obon" is a Japanese traditional summer event held every year. If Oshogatsu/New Year's is the winter festival, the summer festival would be Obon. People believe that their ancestors' spirits come back to their homes to be reunited with their family during Obon. For this reason, Obon is an important family gathering time, and many people return to their hometowns. Many people take a long break from work during Obon, but this year's Obon is exceptional due to the Tohoku Earthquake. The traditional obon period is around the 14th of August, but people take vacations at different times. Some might take vacation at the beginning of August or others at the end of August. So, we have put together events information that covers the entire month of August. For the early Obon vacationers, we recommend these summer festivals below. Neputa, lanterns featuring a large picture of Samurai, will be held high in the starry sky accompanied by the powerful sound of Japanese drums. The festival takes place along the street of Ojima 1 cho-me to the Kameoka shrine. The street will be blocked just for this event. Ikaho's stone steps will be decorated beautifully with flowers. As part of the Gunma Destination Campaign, Ikaho is ready to welcome their guests. Also, if you spend a night at a "ryokan" in Ikaho, admission to Ikaho Green Bokujo or farm will be free until December 31st, 2011. Please ask for more information at the reception counter of the ryokan. This event will be held in front of the Yubatake, the source of the hot springs and the symbol of Kusatsu. People enjoy listening to the Japanese drums and why not try playing them as well. 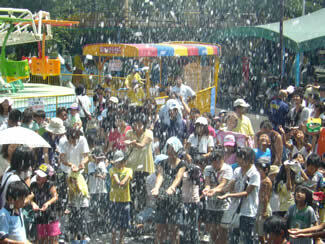 People love the idea of having snow in the middle of the scorching hot summer. Using a generator, it will snow 2 times a day during weekdays and 4 times a day on the weekends (Gunma DC Special). This is a special plan offered at the end of summer vacations featuring treasure hunting, outdoor activities and Goemon style bathing. 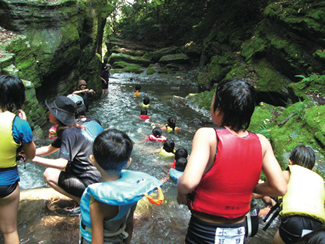 There will be a tour guide and an outdoor instructor who will help you enjoy this tour to the fullest. After the fun activities, there will be a Japanese style BBQ for lunch.